EOS, a leading additive manufacturing solutions firm, has supplied WMG, at the University of Warwick, with a new machine to support research projects using metal manufacturing. The EOSINT M 280 is the leading-edge system for the additive manufacturing of metal products directly from CAD data including tool inserts, prototypes and end products. The machine has been installed at WMG’s International Institute for Product and Service Innovation (IIPSI), at the University of Warwick, and will support primary research across various sectors. The machine was supplied by EOS, the global technology and quality leader for high-end Additive Manufacturing (AM) solutions, with UK headquarters located at the University of Warwick Science Park’s Warwick Innovation Centre in Gallows Hill. It is the third machine EOS has supplied to WMG with previous systems supporting additive manufacturing from sand and polymer materials. Dr Greg Gibbons, head of additive layer manufacturing at WMG, said: “We have a long-standing relationship with EOS having first purchased a sand laser sintering system in 1997 and then a plastic laser sintering system some time later. “It is very much dependant on the type of research we are conducting for example the sand machine was ideal for engine development while the plastics machine allowed us to create complex polymer parts and various prototypes. “Now our research is moving into metal composites and alloys, and although we already have access to other metal technologies, we required a laser-based system that can offer high resolution manufacture of complex metallic components. “We will be developing research funding around the new machine and are hoping to have a substantial number of PhD studentships and postdoctoral researchers working with the machine and looking at processing new materials. “For example, we already have an industrially supported PhD research studentship starting in October looking at new light-weight alloys processed using the laser melting technology. Stuart Jackson, EOS regional manager for the UK and Ireland, said the University of Warwick is one of very few universities in the UK with this level of technology. “The machine is equipped with a fibre laser which melts fine powder and builds up the product layer by layer allowing you to create products with extremely complex geometries,” he said. EOS moved its UK headquarters to Warwick Innovation Centre in 2002 and has since witnessed significant growth with its parent company in Krailling reinvesting 15 per cent of its revenue to support further research and development. The company employs 17 people at its UK base and plans to add three more staff to its team in the next 12 months. 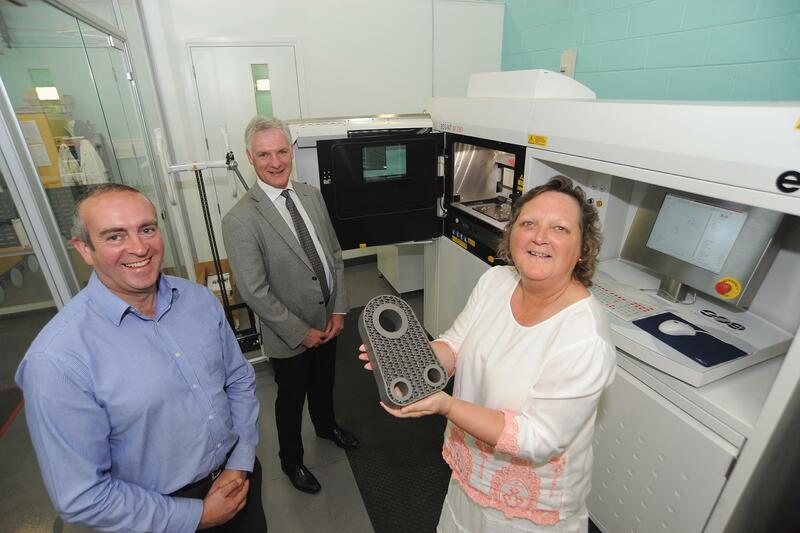 Karen Aston, centre manager at Warwick Innovation Centre, said: “It is great to see two strands of the University working together, with the EOS laser sintering machine helping to enhance academic and research capabilities.